Get your taste buds ready because you get to help decide who makes the best vegan sammich in the San Francisco Bay Area! 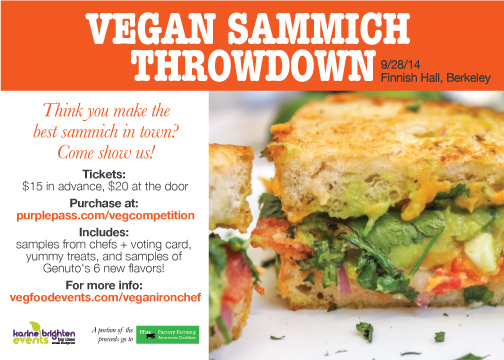 Do not miss the Vegan Sammich Throwdown in Berkeley on Sunday, September 28th. Attendees will be taste-testing the vegan sandwich creations of professional and home chefs from 2pm to 5pm and then voting for their very favorite! The lucky winning chef will have the opportunity to compete in the 3rd Annual Vegan Iron Chef Event next February. Tickets are $15 dollars in advance ($20 at the door), and $3 from each ticket sale will be donated to the Factory Farming Awareness Coalition. 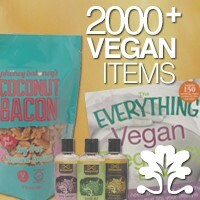 Admission includes at least ten vegan sammich samples, coconut water from Vita Coco, a bag of BeanFields chips, a vegan cookie from Alternative Baking Company, and chances to win some great vegan raffle prizes. Genuto, maker of 100% nut-based vegan gelato, will be dishing out samples of six brand new flavors. So, in addition to voting for the best sammich, attendees will be voting on a brand new Genuto flavor!